Posted on 25, March 2019 by EuropaWire PR Editors | This entry was posted in Education, News, Science, Serbia, Switzerland, Technology and tagged Ana Brnabić, Astrophysics, ATLAS experiment, CERN, CERN Convention, CMS experiment, DELPHI experiment, European Organization for Nuclear Research, Fabiola Gianotti, ISOLDE facility, LEP collider, Mladen Šarčević, NA61 experiment, Nuclear Physics, particle colliders, particle physics, physicists, scientists, SERBIA, UNESCO, Ursula Bassler, Worldwide LHC Computing Grid. Bookmark the permalink. GENEVA, 25-Mar-2019 — /EuropaWire/ — CERN has just received formal notification from UNESCO about Serbia having agreed to the CERN Convention. As a result, the country has become CERN’s 23rd Member State. The other Member States are: Austria, Belgium, Bulgaria, Czech Republic, Denmark, Finland, France, Germany, Greece, Hungary, Israel, Italy, Netherlands, Norway, Poland, Portugal, Romania, Serbia, Slovakia, Spain, Sweden, Switzerland and United Kingdom. Cyprus and Slovenia are Associate Member States in the pre-stage to Membership while India, Lithuania, Pakistan, Turkey and Ukraine are already Associate Member States. The European Union, Japan, JINR, the Russian Federation, UNESCO and the United States of America currently have Observer status. CERN, which stands for European Organization for Nuclear Research, is headquartered in Geneva while having its main location on the French-Swiss and is one of the world’s leading laboratories for particle physics. Commenting on the occasion the Prime Minister of Serbia Ana Brnabić said that CERN is one of today’s most important scientific institutions and investing in scientific research is important for the development of Serbia’s economy. Serbia will be having voting rights in the Council, which is CERN’s highest decision-making authority, and will as well contribute to the Organization’s budget. 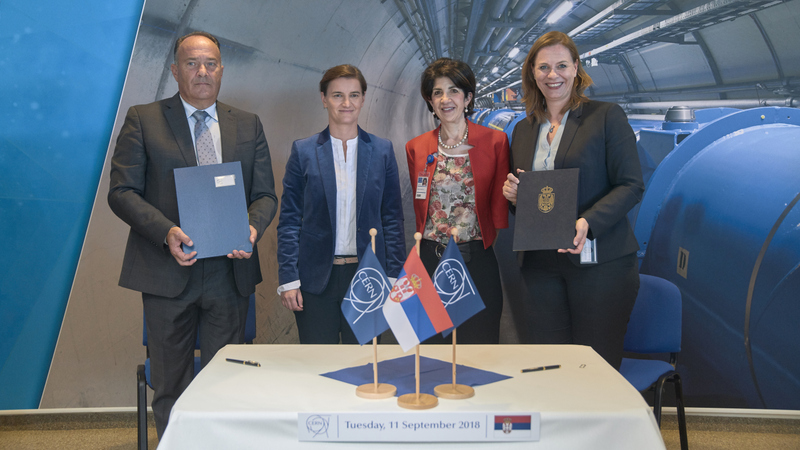 By joining CERN, Serbian nationals will have an enhanced recruitment opportunities at CERN while Serbian businesses can bid for CERN contracts. Yugoslavia, which Serbia was a part of, was one of the 12 founding Member States of CERN in 1954. Serbian physicists and engineers have participated in some of CERN’s earliest projects, at the SC, PS and SPS facilities. Furthermore, physicists from Serbia worked on the DELPHI experiment at CERN’s LEP collider in the 1980s and 1990s. In 2001, CERN and Serbia have signed an International Cooperation Agreement, which led to Serbia’s participation in the ATLAS and CMS experiments at the Large Hadron Collider, in the Worldwide LHC Computing Grid, as well as in the ACE and NA61 experiments. Today, Serbia’s main involvement with CERN is in the ATLAS and CMS experiments, in the ISOLDE facility, which carries out research ranging from nuclear physics to astrophysics, and on design studies for future particle colliders – FCC and CLIC – both of which are potentially new flagship projects at CERN. “Investing in scientific research is important for the development of our economy and CERN is one of the most important scientific institutions today. I am immensely proud that Serbia has become a fully-fledged CERN Member State. This will bring new possibilities for our scientists and industry to work in cooperation with CERN and fellow CERN Member States,” said .